I'm map dumb. I love maps, I'm creative about what to put on them, I just trip up on scale. My current campaign is set in my old game world only because it takes so much effort to invent a new world. Not that I dislike my old world, but I've grown so much since I envisioned it-- I've lived in Europe, I've read a bunch of Livy-- that I want to revise the history and political layout of the world to make it more complex, rich, and "realistic." Knowing that, and wanting to avoid the tyranny of pre-existant detail, I scooted the window of play down from where my old players explored. This means I have to flesh out what is in this new area. 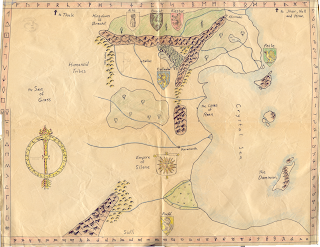 Fine, I have all my original maps-- map of the continent, map of the zoomed in region my players had explored. But I just have a hard time mentally zooming in and out in the way scaling these maps requires. Maybe it is modern day travel and the fact that I can be out of state in a day-- a state the size of a medieval country-- or that I can cross the continent in a day (by plane) or several (by car). I have a hard time clicking in my head what the vastness of the world would be to my characters. I remember struggling with this years ago, pouring over the Wilderness Survival Guide and the Greyhawk boxed set to figure out how latitude applies to weather and the distance of each degree of latitude. Maybe that's my problem, I'm trying to make it all too realistic, too scientific. Regardless, I have a hard time deciding whether I should be going from top down- the players are in this region with this river and this trade road-- or from bottom up-- there will be a bridge with a troll here, and an abandoned inn here. The way I tried to deal with this was to use what I know well as model-- where I've hiked in the mountains here, and what that looked like, in comparison to the state as a whole. It worked to a point, but my game world is sort of just a flipped California because of it. I had a very happy moment when I noticed that past Telecanter had the foresight to write the hex scale on the back of my world map and even used the convenient league (humans walk ~ 1 per hour). But my excitement fell when I saw that the scale on my zoomed in local area map was absolutely wrong. I don't know how I could have made such a mistake: a closeup that uses a larger scale than the original it's zooming in on! So what to do? Well, luckily I think my local areas scale was really too big-- villages too far away from one another, so I can just handwave it to the correct scale and I think the map still works. For the new area of play I'll stick with moving the frame to an unexplored but adjacent area of my world. I'll use Chgowiz's One Page Wilderness Templates at a scale of 3miles per hex. And I think I'll use his hex-shaped JG template (Judge's Guild?) at a scale of .3 miles per hex to get in closer. Yes, I definitely think my old "realism hang ups are at play because when thinking of what to fill these maps with, I immediately started wondering where the river was and how that would affect ecosystems. I know, I know, I should just put a magical glacier there or something, haha. It's just one of my quirks I guess. Sorry to interrupt your think aloud, and apropos of absolutely nothing: nice compass rose! Haha, thanks! That script encircling the rose means something. Danged if I can remember what it was. I'll have to see if I can parse it (the alphabet it's in runs down the right of the map).